Make a fresh cut to remove about a 1/2-inch thick disk of wood from the base of the trunk before putting the tree in the stand. Make the cut perpendicular to the trunk area. 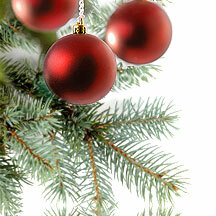 To display the tree indoors, use a stand with an adequate water holding capacity for the tree. As a general rule, stands should provide 1 quart of water per inch of stem diameter. The temperature of the water used to fill the stand in not important and does not affect the water uptake. Keep trees away from sources of heat [fireplaces, heaters, heat vents, direct sunlight].